Posted on Tuesday, September 18th, 2007 at 5:50 am. Dani Azathonian Hands (drums), Su-Nung the Bloody String (hena), Doris Thunder Tears (bass), fan Ken Pierce of Piercing Metal, Freddy the Left Face of Maradou (vocals), CJ Dispersed Fingers (keyboards) and Jesse the Infernal (guitar) after a show in New York City. They have spurred 16-foot mosh pits in California. Fans have asked them to bite their necks (a girl fan got a kiss on her cheek instead). They keep smiling despite flat tires, lost instruments and having their masks confiscated at international security. They have compelled our Taiwanese parents to attend their concerts and endure hours of aural abrasion to show their support for Taiwan. Heavy metal god Ozzy Osbourne invited them to join Ozzfest as Chthonic (THON-ick, Greek for spirits of the underworld), the first Asian metal band to play the metal festival. 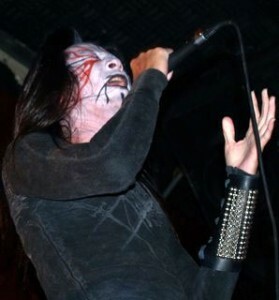 Not only are they Taiwanese, metal and “black” metal, they are political. Rousing yet beautiful heavy metal anthems, guttural growls mixed with Taiwanese myth and history simultaneous with educating a whole new demographic about Taiwan’s struggle to defeat diplomatic isolation. 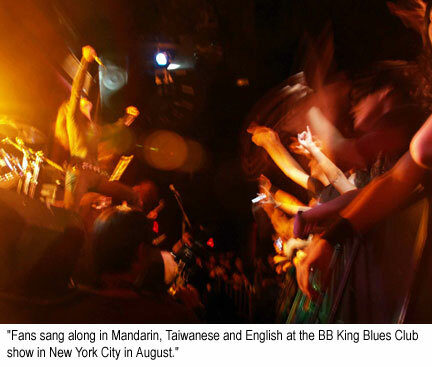 Chthonic is reaching fans that are generally not aware that Taiwan has been self-ruled since nationalist forces fled there in 1949 after losing civil war with communist forces in China. It had a United Nations seat as the Republic of China until 1971 when China asserted sovereignty and threatened military action if Taiwan tried to secede. Chthonic’s debut album, Where The Ancestors’ Souls Gathered, describes the perilous sea journey between China and Taiwan. Sophomore recording 9th Empyrean, told of an epic battle between Chinese Han spirits and the spirit gods of Taiwan’s aboriginal people. Relentless Recurrence was inspired by a Taiwanese folk legend about a demonic ghost that seeks revenge. Even the face paint derives from Taiwanese folklore and art. Corpse paint allows some gods the power to judge good and evil. 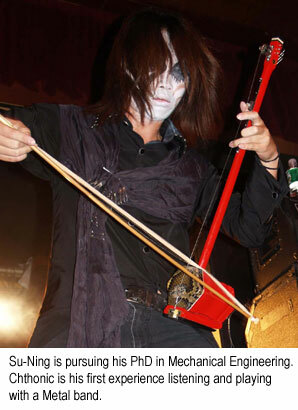 Fans quickly agreed that the use of the hena, a traditional Eastern two-stringed violin, adding a female element (the bassist is female) and having a cause makes Chthonic innovative and refreshing in the black metal world that is usually anti-Christian or simply mythological. They ended the night with “UNLimited Taiwan.” The rate of hair-whipping and headbanging rose exponentially as Freddy sang and screamed about how the U.N. is limiting Taiwan’s unlimited potential to rise up in the international community. Chthonic headlined a special show just blocks from the U.N. on Sunday at Highline Ballroom in New York City and just days before the 62nd United Nations General Assembly session opens. 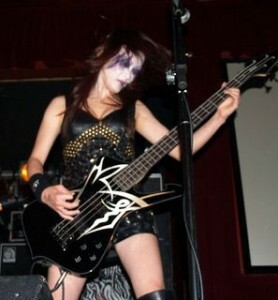 New Jersey-based rock group Hsu-nami opened. Hsu-nami also features the hena in their music. Chthonic is continuing to tour nationwide with Cradle of Filth before its European tour with Finnish folk-metal band Ensiferum begins. Email [email protected] with subject line “Chthonic” for a chance to win an autographed CD or autographed paper Chthonic dolls. Send your email by October 13, and we’ll randomly pick our winners. *EDIT* Congratulations to Catherine C. of Cambridge, MA for winning the prize! Here is the band website. Do not be afraid.